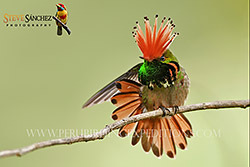 Peru boasts one of the highest bird lists of any country in the world with over 1600 species recorded within the country. On this tour we will be exploring several altitudinal zones in the north of the country, from the high Andes to lush tropical rainforest. 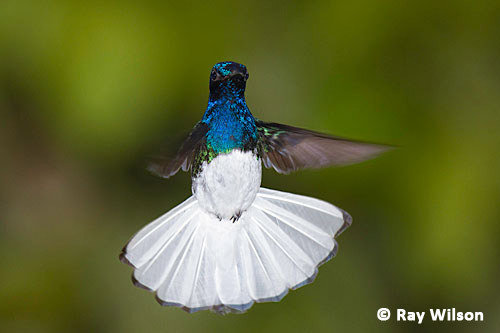 Hummingbirds will be one of our main focuses on this photographic tour and the hummingbird diversity in this area is high with at least 23 species on offer, including one of the most sought after endemic birds in Peru: the Magnificent Spatuletail! 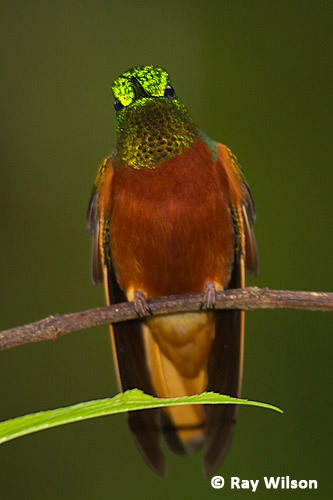 Other spectacular hummingbirds we will see (and, of course, photograph) include Sword-billed Hummingbird, Rufous-crested Coquette, Emerald-bellied Puffleg, Royal Sunangel to name just a few. 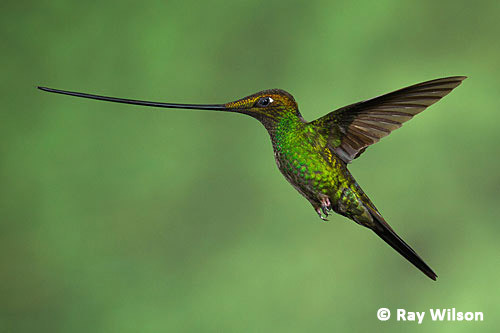 During the course of the tour we will have several opportunities to photograph numerous hummingbirds, including the Magnificent Spatuletail, using multiple flash set-ups to freeze the motion of their rapidly beating wings. Of course, this area is not just rich in hummingbirds and a staggering array of other birds will also be seen during the tour, with highlights possibly including Long-whiskered Owlet, the recently described Johnson's Tody-tyrant, Oilbird, Black-bellied Tanager, White-Capped Tanager, Red-hooded Tanager, Yellow-scarfed Tanager, Metallic-green Tanager, Fiery-throated Fruiteater, Lettered Aracari, Emerald Toucanet, Ochre-fronted Antpitta, Zimmer's Antbird and many, many more. 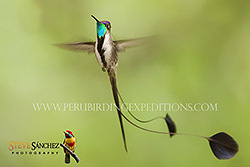 For this tour, and the one to Manu National Park, I am teaming up with Peruvian bird guide Steve Sanchez who is himself an accomplished photographer. Both tours run consecutively and can be combined if you want the full Peruvian experience with a longer tour ($250 discount from the total price if you join both tours). The return domestic flights from Lima to Tarapoto are not included in the above cost, as these are usually much cheaper if you book these at the same time as your international flight. We will advise you as to which flight to reserve when we receive your booking or, if you prefer, we can arrange the domestic flights for you. International flights and transport to the start and end points of the tour.